My Candy Delight Quilt measures 20" x 20". It is made up from 16 5" square blocks. The design is simple, modern and very easy to make. 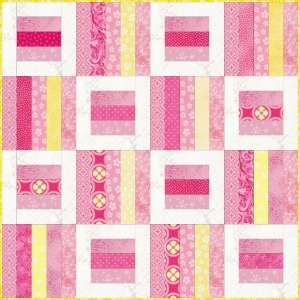 To make this quilt you will need a selection of pink, yellow and white fabrics. I went into my stash and scrap containers to make this quilt. There is no piece bigger then 5 1/2" x 1 1/2", binding and backing excluded. 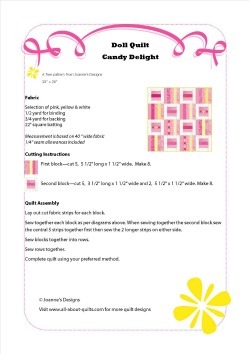 Candy Delight is made from 2 different blocks. Each block finished is 5" x 5" square. 1/4" seam allowances have been included in the instructions. For the first block you need 5 different fabrics cut 5 1/2" long by 1 1/2" wide. For the second block you need 4 different fabrics. Cut 5, 3 1/2" long by 1 1/2" wide. Cut 2, 5 1/2" by 1 1/2" wide. 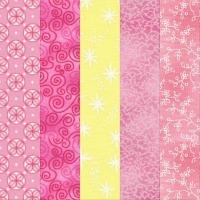 Arrange fabric strips into blocks and lay out on a flat surface to check your color combinations. Reposition as needed. When happy with your layout sew each block. Once all the blocks have been completed it is then time to sew them into rows. Arrange your blocks in the desired format. 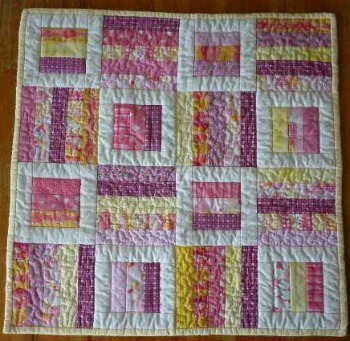 Sew each block together in rows. Then sew the rows together. I used polyester batting as it is easy to wash & dry and generally one of the cheaper battings. The disadvantage to polyester for dolls quilts is that it can tend to be a bit stiff. Quilt and bind using your preferred method. On my quilt I used a 2 1/4" wide binding and used the double fold continuous binding method. You probably could get away with a single fold binding. As there are 3 girls going to play with my wee quilts I decided to used the harder wearing binding method. 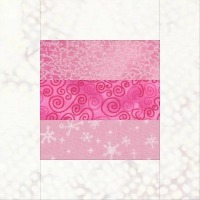 Click on the image below to download a PDF pattern for this quilt. Here is the wee quilt I made from this pattern. The photo was taken after the quilt had been washed.